I am originally from Winston-Salem, North Carolina, but have happily called the mountains of Asheville home for the past three years. 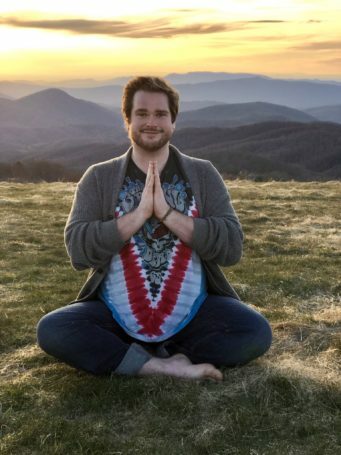 I came to Asheville seeking a new way of existing, and desperately needing a life change. When I found my yoga practice, it was as if a light went off within me and I felt the wheels of life changing. I knew I’d never be the same person again. My practice led me from depression and anxiety, to managing, and soon thriving. After completing my yoga teacher training, it is now my hope that I can perhaps help others find their way to freedom of mind and spirit by helping them connect to their own yoga practice. This class is focused on the power of slowing down, breathing into the moment and sinking deeper into the connection with our moving bodies. Drawing from other aspects of the 8 limbs of the yogic path such as breathing practices, sensory withdrawal, concentration, and postures, we will begin to build a bridge connecting the physical practice, and the deeper nuances of yoga in our mat practice, and contemplate how we can weave it throughout our lives off of the mat. Together, we will explore the postures with mindfulness, and allow that state of mind to expand and deepen as we end the practice by exploring different types of seated and reclined meditation and draw attention to centered focus on the breath. We will allow this state of mind to bring us to ultimate relaxation before coming into a sweet Savasana.